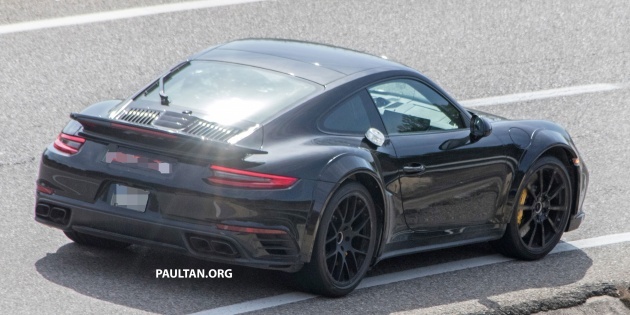 The next-generation 911 Turbo, the 992, has been spotted testing, here seen wearing 991-generation bodywork. It seems that the new car will be larger than the current model, with wheelarch extensions seen on this development unit expected to house wheels and tyres of even greater dimensions. Even higher levels of grip can be expected, which, in turn, should have even more power and torque exploiting them. With the current model cranking out 580 hp in Turbo S guise, the 992 model could breach the 600 hp mark relatively easily. Performance benchmarks are also expected to be further raised beyond the current 911 Turbo S’ 2.9-second 0-100 km/h time and 330 km/h top speed. Underneath the familiar bodywork is said to be a new, modular platform which is set to be shared with other sports cars within the larger Volkswagen Group, such as the next Audi R8 and the successor to the Lamborghini Huracan. The new modular platform upon which the new car will be based could also form the basis of Porsche’s mid-engined supercar to contend with the likes of the Ferrari 488 GTB and McLaren 720S. Expect further innovations in engine tech, beyond the variable geometry turbines and charge pressure maintenance for improved transition of throttle over the current model. In the chassis department, rear-wheel steering can also be expected to help aid both high-speed stability and low-speed agility, as at present. 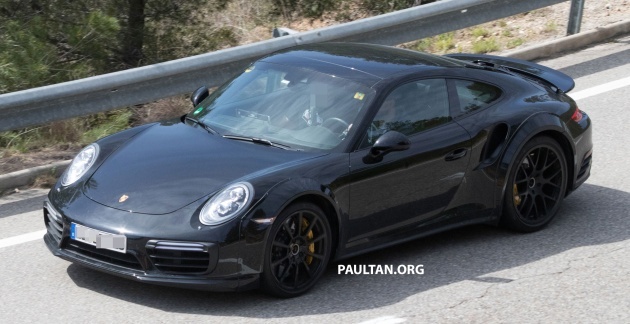 The next-generation 911 is expected to debut in 2018 at the soonest, and the Turbo variants should follow shortly after. That’s very interesting. The 911 is sharing platform with 2 other cars in the VW group. But those cars are mid engined, whereas the 911 has always been rear engined, which gives it ridiculous acceleration, but handling is a bit more interesting in the rear end. Sharing of modular platform with R8 & Lambo Huracan will ultimately save costs since they all come from the same family. What I’m surprised is that Porsche, Lambo & R8 managed to have their own identity & still look distinctively different. They all have their own niche market of followers. However, Porsche with the 911 will always be the bread & butter of the company which is profitable to say the least. Thanks to having an open book where professionals runs the companies & NOT for personal glory. 911 is not even CKD in its biggest market (USA). What makes u think it will CKD here?